Results-Driven Solutions: Setting Performance Goals for Your Entire Team | Paragon Resources, Inc. Here is the latest edition of our newsletter for financial professionals. Please feel free to share the content of this newsletter with anyone who can benefit from it. And, if there is anything that you would like for us to include in future newsletters, let us know! We base our newsletter content on your specific needs and what we hear from the field. To submit a topic that you’d like to see in upcoming newsletters, please email us at info@ParagonResources.com or info@knownobounds.net. Happy 2016! I hope you are weathering the start to the year and handling its wild beginning. For this newsletter, we provide a process for setting goals for the upcoming year. There are two major flaws that we see with advisors when putting together their business plans: 1. only setting production goals and 2. not involving their entire team in the goal setting. DON’T make these mistakes this year. Truly successful investment professionals spend ample time working on the business and not just doing business. They understand that business planning needs to be an ongoing process throughout the year and not just an annual event. Although most business plans focus only on setting revenue goals, increasing assets under management alone does not ensure a profitable business. Planning should involve every aspect of your practice. Client retention strategies, team efficiency, and the team’s services are just a few examples of focus areas that need to be continually evaluated and developed. So how do you get started? First, you should elicit the help of your team. In order to achieve great goals, you will need help. Other team members can challenge and enhance your ideas which will produce better results. Team members can hold one another accountable for the results to ensure that they are more likely to occur. Having your team members involved in the process will also make them feel as if they are a part of the success of the practice. You need to ask them for their suggestions to improve the business so that they have buy-in to the goals set for the business. Schedule a team meeting with the specific purpose of evaluating the effectiveness of your practice. To prepare for this meeting, identify all of the core functions of your business. To get started, think of the FIND-GRIND-MIND Model that we use at a high level. Every business has to FIND clients and sell to them, GRIND out work for them such as investment strategy and paperwork, and then MIND the relationships with great service so that they come back for more. 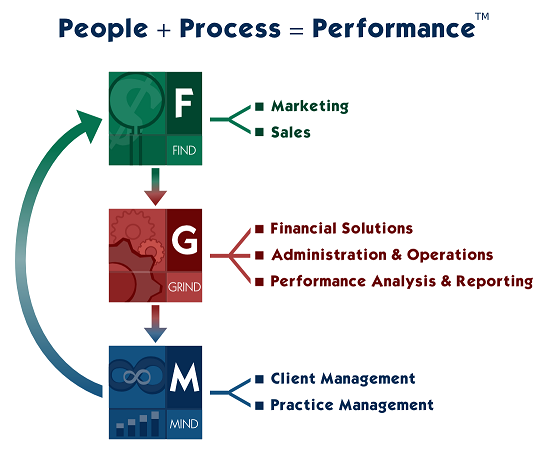 Breaking down these three elements even further will lead to your core functions, like the visual below. You will then be able to identify WHO on your team is responsible for each function so that they know their role on the team and how they relate to one another. Now you should define a perfect practice in regards to these functions. Articulate what a “10” looks like in each of these core functions so that you have a standard by which to assess your own effectiveness. Prior to the team meeting, ask each person to rate your business based on a perfect description. If they don’t give a score of “10” to a particular function, then they should explain what the gap is and suggest solutions to close that gap. They should document all of their thoughts and come prepared to share their input during your team meeting. Note: You may want to consider our Business Performance Assessment to assist you in uncovering the roadblocks to your next level of success. This unique industry diagnostic tool will not only help you gain a better understanding of where time is being spent, but it will also provide you with a 360 degree perspective of the efficiency and effectiveness of each of the three FIND-GRIND-MIND™ building blocks. You will receive an inventory checklist, our Client Relationship Lifecycle™ process to help systematize your practice, and you will be able to utilize your unique results as a plan of action for your business planning. During your team meeting, have a round-table discussion on each function. Have each person read out their score and offer their suggestions. Make note of the distribution of scores and calculate a team average score. You will want to discuss any large variances in opinion. If someone gives Client Service a “9” and another team member gives it a “3”, then you need to find out why there is such a difference in opinion. After everyone has shared their input on each function, schedule another meeting to discuss what initiatives your team will agree on to improve the overall effectiveness of your business. To prepare for this next meeting, consolidate the comments and suggestions for the functions and provide each person with a copy. Each person should take the functions that they are most responsible for and develop goals based on the team’s suggestions. When defining the strategies each person will take, they should also create a step-by-step plan of execution and a target completion date. During your final planning meeting, each person should present their goals and where needed, refine their objectives with the team’s input. The leader(s) of the team should help set priority and provide them with the support they need to implement their ideas. Each person should commit to time blocking 10% of their week to work on these initiatives. In future weekly team meetings, these goals should be constantly reviewed. Mid-year, we suggest that you conduct another effectiveness survey to see if there has been any improvement. Current initiatives can be reevaluated and new initiatives can be determined. Planning should not be an event, but an ongoing process throughout the year. With everyone committed to the improvement of the practice, the business has no boundaries to success. Happy Planning! Assessments: Performance Insights Process – Comprehensive 360° assessment tools reviewing the PEOPLE, the TEAM, and the BUSINESS.